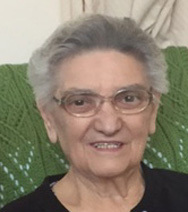 Santos, Maria M., 82, Formerly of Cranston, passed peacefully Tuesday at the Riverview Health Center. Born in Portugal, a daughter of the late Antonio Nunes and Paixao Muxagata, she came to America in 1971 and soon after became a US Citizen. She was the wife of the late Jose dos Santos. Mrs. Santos enjoyed knitting, crocheting, gardening and loving her family. She leaves a daughter Connie S. Paulo of West Greenwich, 2 sons: Antonio Santos of Manchester, CT and Luis Santos of San Diego, CA, 6 sisters; Eugenia Santos of Brazil, Emilia Marcos, Otilia Paciencia and Graca Gomes all of Portugal, Irene dos Santos of France and Lucilia dos Santos of Cranston, 5 grandchildren, Michael and Jessica Paulo, Vanessa Tanabe, Luis Santos, Jr. and Alexia Santos and 1 great grandson Jared Carneiro. Her life will be celebrated with calling hours Friday from 5-8pm in the Stapleton Family Funeral Home, 684 Park Avenue, Cranston. Funeral Saturday at 8:30am from the funeral home with a Mass of Christian Burial in Our Lady of the Rosary Church, 21 Traverse St. Providence. Burial will be in St. Ann Cemetery, Cranston. Go to cranstonfuneral.com for full obituary.